Fostering an interest in natural resources careers and closing the academic achievement gap for Native American youth. Salmon Camp 2019 will be hosted by the Nez Perce Tribe August 11-17. Applications will be available at the beginning of May. I wanted my child to attend Salmon Camp to be exposed to science, culture, and people who work to restore the runs of our sacred foods. Salmon Camp is a component of the Columbia River Inter-Tribal Fish Commission’s Tribal Workforce Development program. 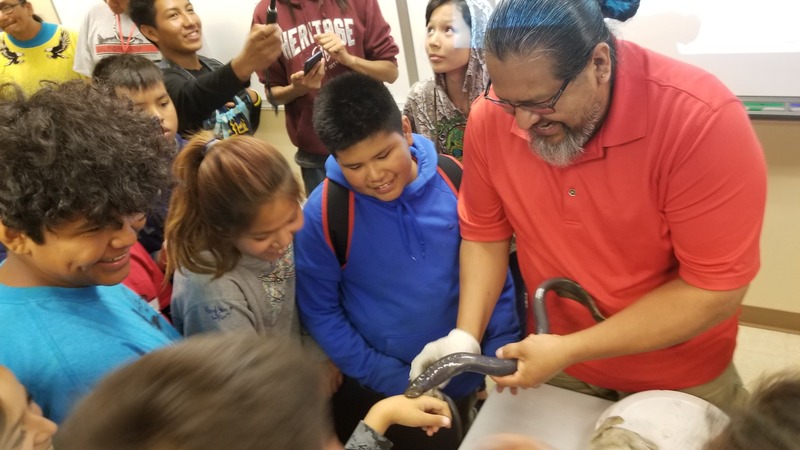 The annual camp focuses on providing culturally relevant science, technology, engineering, and mathematics (STEM) experiences to foster an interest in natural resources careers and close the academic achievement gap for Native American youth. Twenty incoming 6th-8th grade students from the four tribes are selected to attend the free camp. Meals and lodging are provided and, after the program is successfully completed, a stipend is offered. The week-long camp is held during the summer in tribal homelands. The four tribes take turns hosting Salmon Camp. The 7-day, overnight camp exposes the students to a blend of Western science and traditional ecological and cultural knowledge. The success of Salmon Camp depends on great people who are committed to and enjoy working with kids. Adult counselors (19+) mentor the students and provide guidance and encouragement for the campers while they’re away from home. Junior counselors (16-18) help the counselors and get an opportunity to gain leadership and mentoring experience. Please check back in May for more information and application. Salmon Camp 2019 application will be posted in late March. What Happens at Salmon Camp? Each CRITFC member tribe takes turn hosting Salmon Camp on a rotating 4-year schedule. 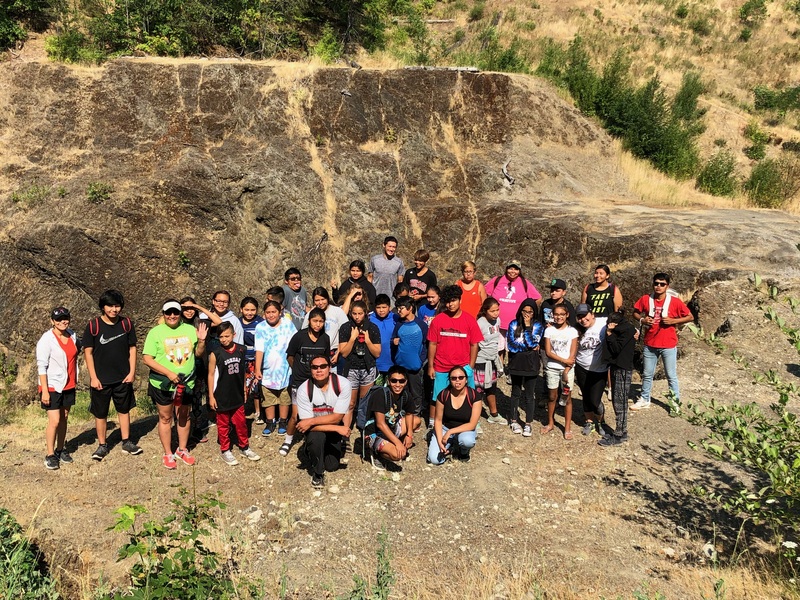 To give an idea of the kinds of experiences and activities camp participants have, below is a day-by-day travelogue of last year’s Salmon Camp hosted by the Yakama Nation. It took place on the Yakama Reservation closed area at Camp Chaparral. 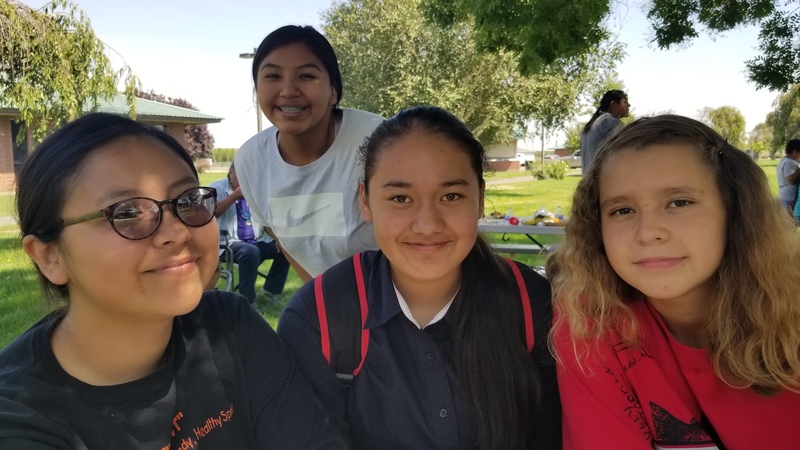 Twenty-five Warm Springs, Yakama, Umatilla, and Nez Perce middle school students from throughout the Columbia Basin participated. 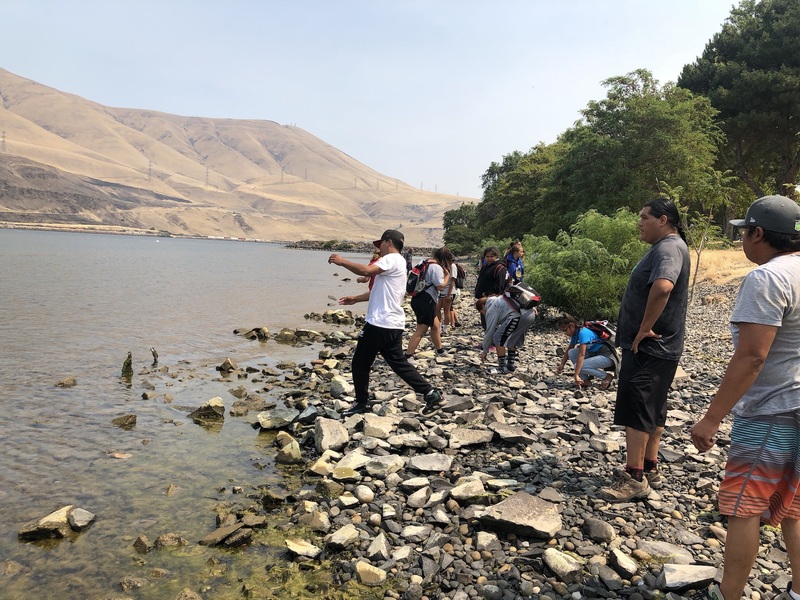 With the assistance of the Yakama Nation Fisheries Department, participants learned about cultural traditions and customs and got hands-on experience exploring the salmon life cycle, watershed health, and food webs. The campers also had opportunities to speak with professionals about their education and career and were provided with resources on college preparation, financial aid, and course selection. Salmon Camp is unique because all the different tribes come together. Salmon Camp began with campers arriving at theYakama Nation Museum and Cultural Center in Toppenish, Washington. The hour bus ride to Camp Chaparral allowed the campers to visit with one another and begin new friendships. 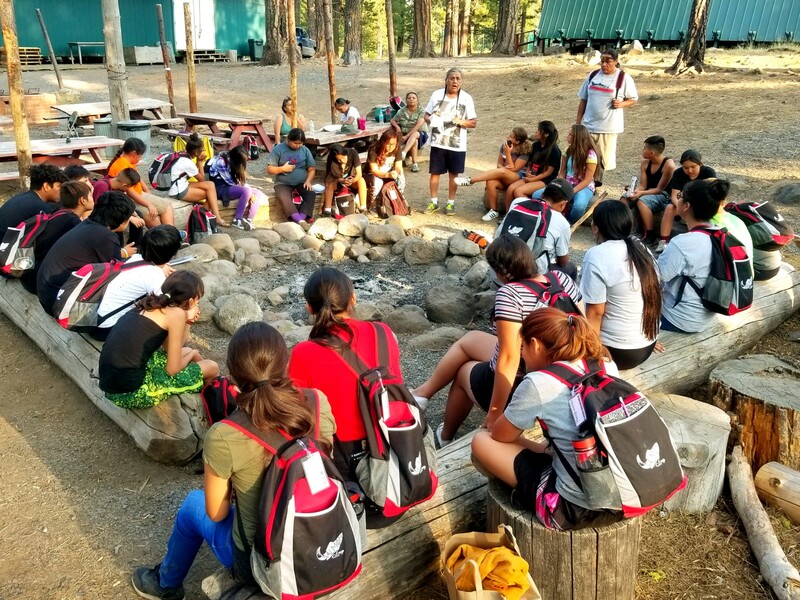 Upon arrival at camp, campers settled into their cabins with their cabin counselor, took a tour of the camp, and gathered around the fire pit for introductions and ice breakers. 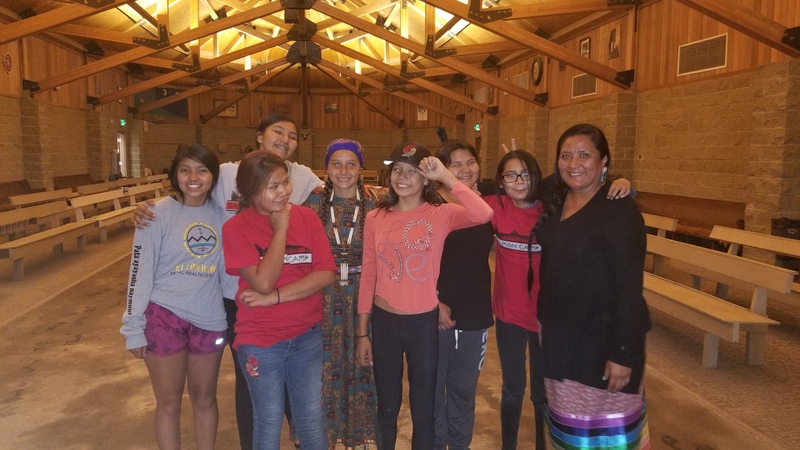 After reviewing the camp schedule and hearing from the camp Cultural Leaders, the campers developed the Salmon Camp Code, which they all agreed to abide by through the duration of camp. For an evening activity, the campers learned how to make wapaas (flat twined bags) that they could work on through the duration of camp. They also learned teachings of the sweathouse; many of the campers were excited they would get to sweat while at camp! The first full day of camp was spent along the Columbia River. It was a chance to emphasize all of our connection to the other CRITFC tribes and each other. 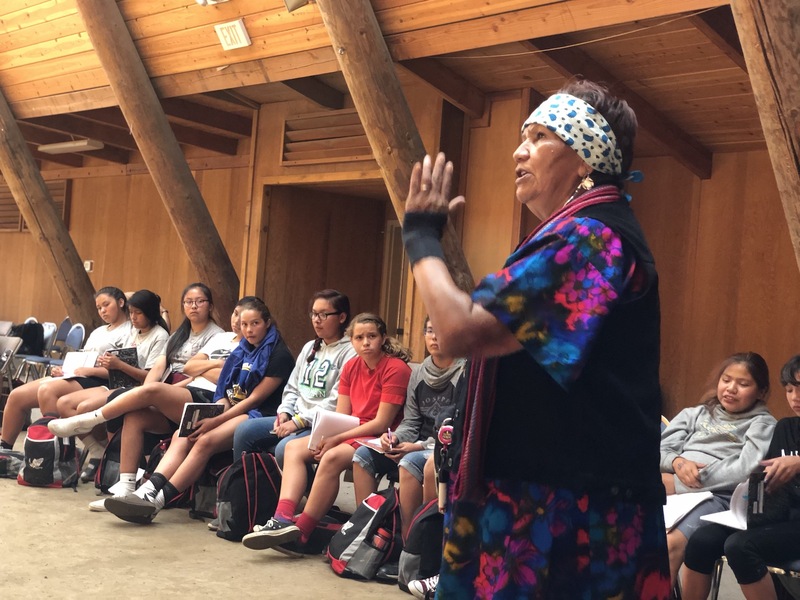 Karen Whitford, a Celilo elder and traditional storyteller, discussed tribal enrollment, the history of Celilo Village and falls, and how all the tribes in the Northwest were connected to the site. She shared traditional stories about Coyote and other animal relatives. Afterwards, the campers went down to the bank of the Columbia River to learn about the area before the dams and the fishing techniques their ancestors used along the river. 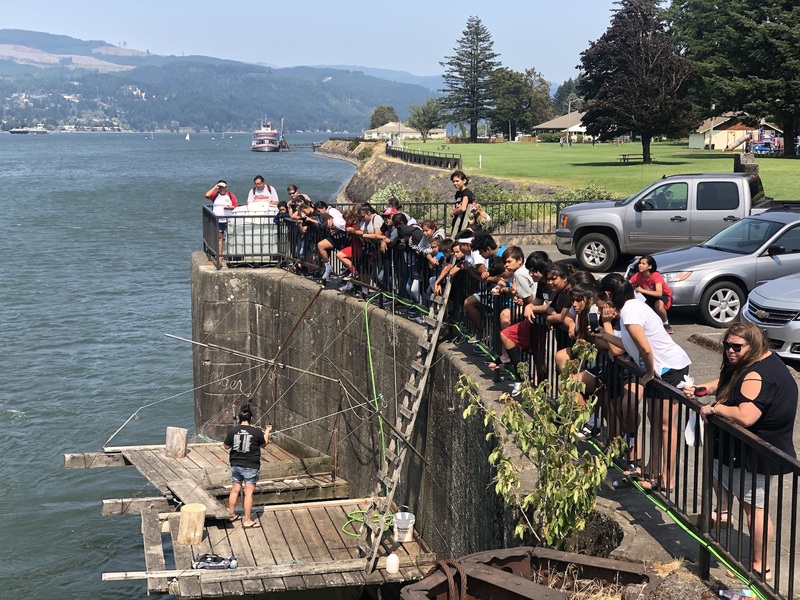 Traveling further downriver, the campers visited Cascade Locks for a scaffold fishing demonstration. Umatilla fisher Terrie Brigham spoke about tribal sovereignty and the importance of cultural values like hard work, respect, and integrity in her family fishing business. A quick tour through her Brigham Fish Market gave the campers a sense of what it takes to have a successful business. 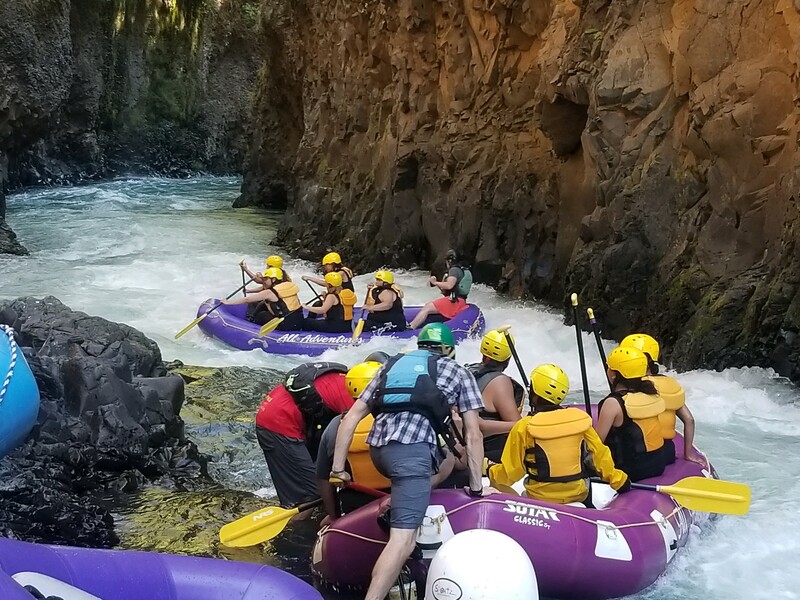 On their way back to camp, the students stopped in Hood River to swim in the Columbia River to cool off on the hot day. That night, the campers participated in a sweat. My favorite part was rafting because we got to be with the water. The Condit Dam removal site was the first stop on day three. Campers learned about the impact dams have on the journey of anadromous fish species like salmon and lamprey. Yakama Nation fisheries biologist Jeanette Burkhardt described the site and led a short hike to the top of where the dam once was. She shared a model of the dam, historical pictures, and how the fish returned after the dam removal. From there, the group traveled upriver by to Northwestern Park, which was once underwater behind the dam. 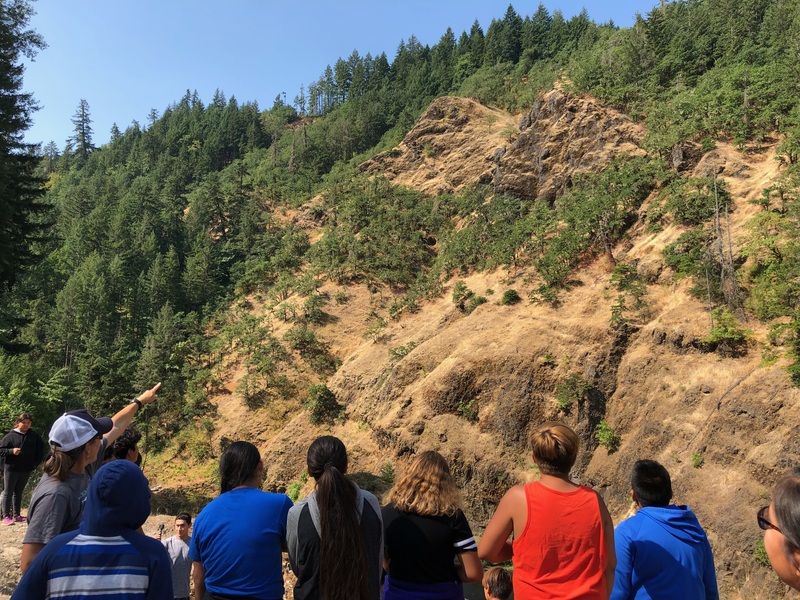 The site is being restored by ecologically and culturally appropriate species, which the campers learned about on a plant walk with Jeanette and Salmon Camp cultural leaders. Campers also learned about how drones work and are being used for natural resource monitoring in various capacities. Campers were given GPS units and were challenged to mark reference points for the drones’ flying route and image capturing. 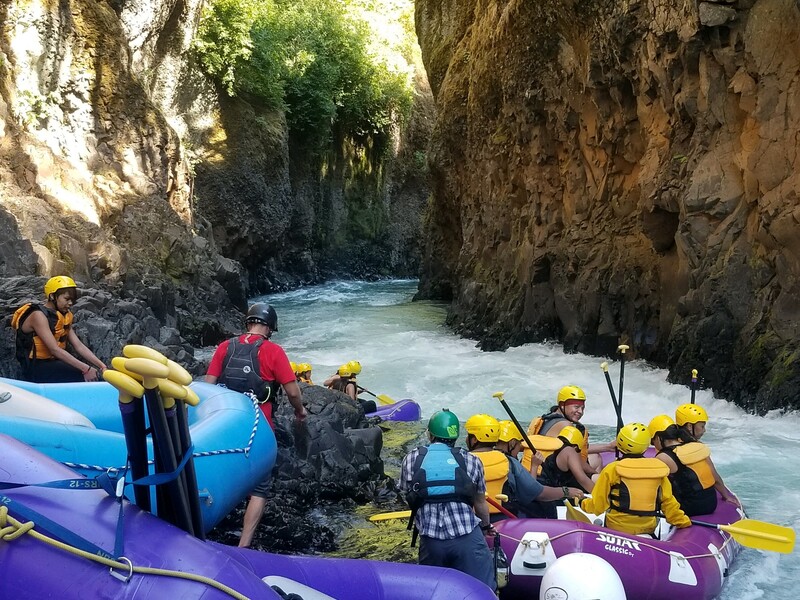 After lunch, the campers rafted the White Salmon River and saw the former dam site from within the depth of the canyon. Some rafts were counting in Sahaptin to keep their paddling in sync, while others shared their newly gained plant knowledge with the river guides. It was not only the sights, but the sounds, smells, and feeling on the river that campers will carry-on. Salmon Camp has made me more interested in making baskets, how things work, and the First Foods and how to protect them. Understanding our ecosystem from mountaintop to riverbed is key protecting salmon and other culturally significant fish species. 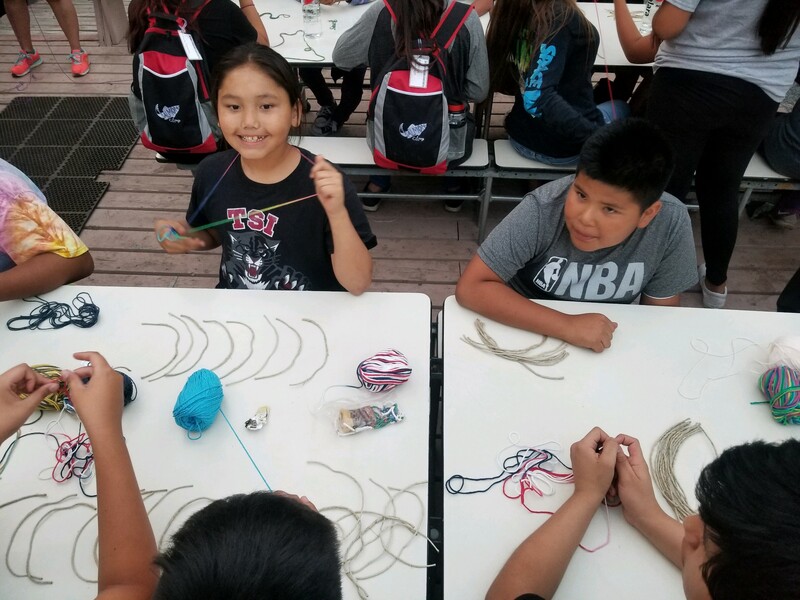 The campers learned about tribal history and fishing tools from the Yakama Nation Cultural Resources Department through a variety archaeology activities. 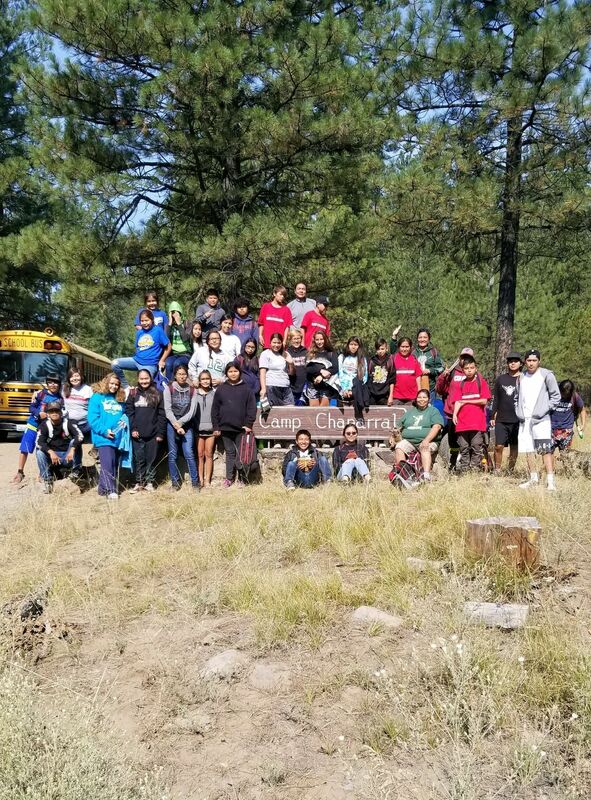 Yakama Nation Fisheries led activities where the campers learned about instruments used to monitor water quality and methods used to collect macroinvertebrates. They deemed the water quality was good and reported that the water was suitable for salmon. At another station, campers were given an overview of stream assessments and were able to electrofish, collecting data on fish species present. During lunch, Yakama Nation fisheries biologist Elaine Harvey and Salmon Camp cultural leaders gave an ethnobotany presentation. Yakama Forest Products resource manager Doug Olney journeyed with the campers to Mount Adams Lake, stopping to discuss the impact of forest fires on fish habitat. The afternoon was filled with trout fishing, medicine gathering, cedar bark peeling, and salmon filleting. 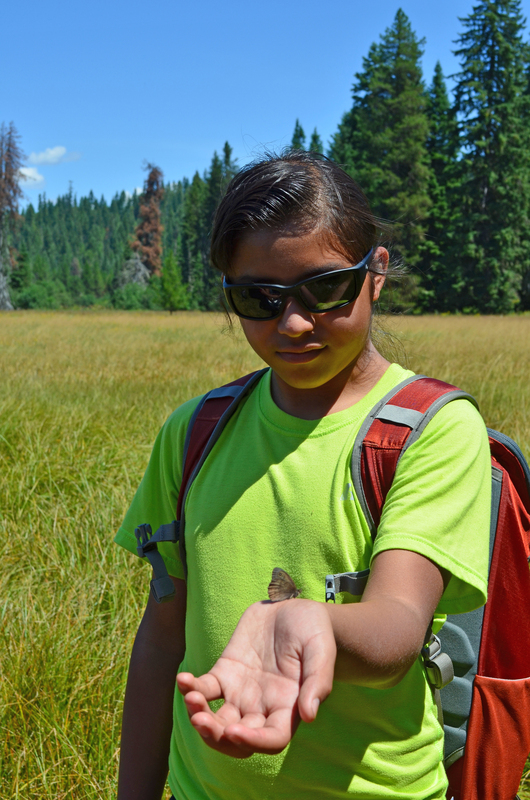 Although no trout were caught at Mount Adams Lake, the campers enjoyed gathering medicines and learning language like áyun’ and qawsqaws—Yakama and Nez Perce words for osha root (Ligusticum sp). 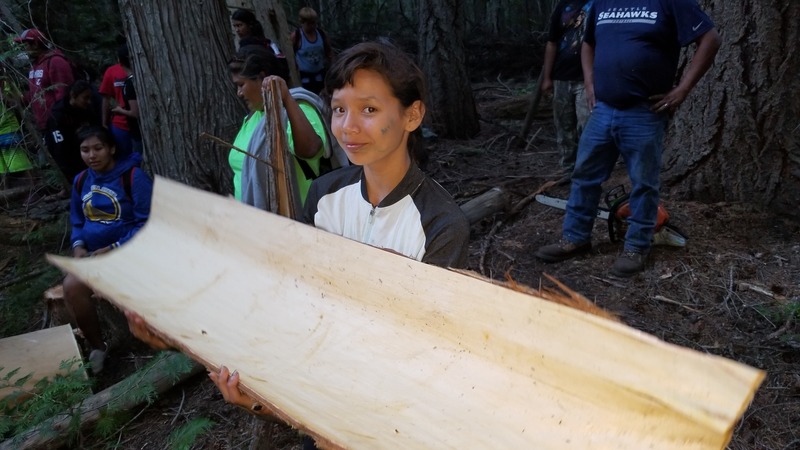 That evening the campers were shown remnants of peeled cedar trees and then helped peel a tree. Cultural leaders and camp counselors led salmon filleting workshop for the campers. The night was wrapped up with a hot sweat. I speak often with my child about college and preparing to move forward. Salmon Camp gives her ideas about possible areas of focus and different colleges. Visiting Heritage University was a full-day experience. Upon arrival, Dr. Jessica Black greeted the campers and guided a campus tour. 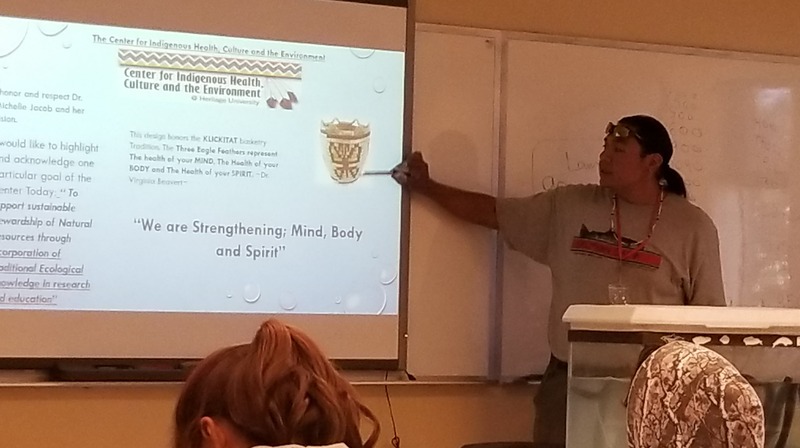 In the Science Building, camp counselor Michael Buck gavea presentation about the scientific method and his research focusing on interviewing elders and gathering traditional ecological knowledge to guide restoration efforts. Yakama Nation Fisheries staff brought in live lamprey and gave a presentation about these prehistoric fish. Afterwards, the campers rotated through three stations: Nutrition of Traditional Foods, Lamprey Dissection, and Steelhead Dissection. 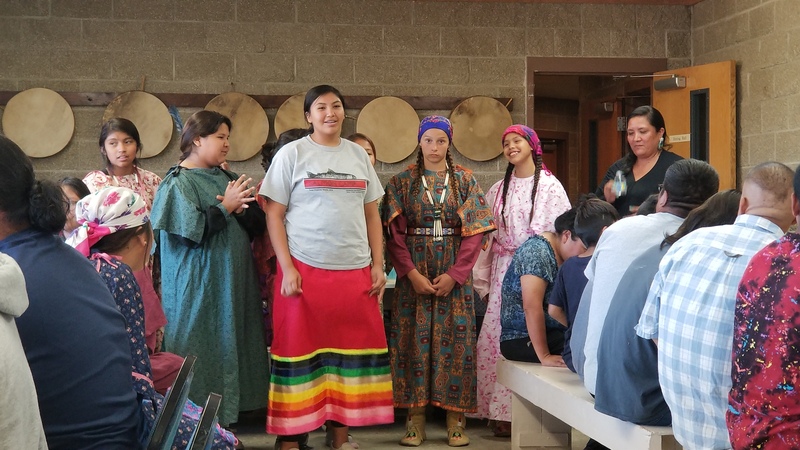 The Nutrition of Traditional Foods station was a presentation showing a film developed by Yakama tribal youth that featured traditional foods through interviews with community members. 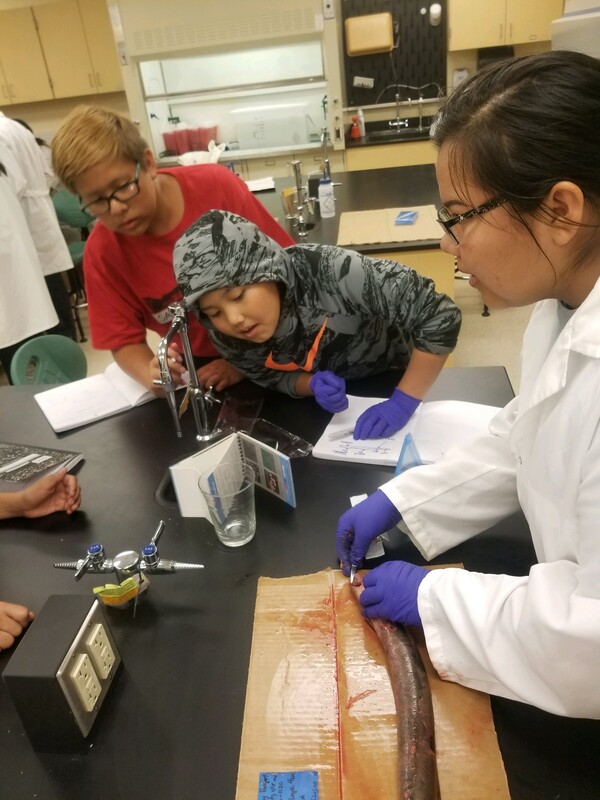 The dissection stations were led by high school youth participating in a summer program for Yakama students that was sponsored by the National Institutes of Health, Heritage University, and Pacific Northwest University. In the evening, campers did a fish printing activity, prepared medicine bundles, and participated in a sweat. Salmon Camp gave perspective into Native culture, but also provided thought into future possibilities. 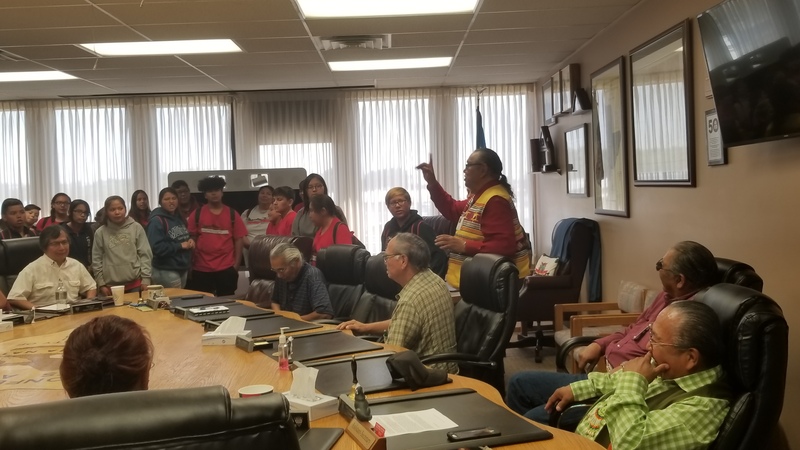 Yakama Nation Tribal Council invited campers into the Meninock Council Chambers to learn about tribal leadership and government, treaty rights, and share a pizza lunch. Each of the campers had an opportunity to introduce themselves and ask questions of council members. In the afternoon, the campers visited the Yakama Nation Marion Drain Fish Hatchery to view sturgeon at various life stages, measure water temperature, and assist with feeding. The last camp activity was a traditional dinner hosted at the Toppenish Creek (White Swan) Longhouse. The campers learned about protocols in the longhouse, the traditional first foods, associated stories, and preparation methods. I hope my boys are able to attend Nez Perce next year. It’s important to stay connected to the nearby tribes in a joint effort to keep our traditions and resources alive. Friendships across tribes were formed throughout the week. As the campers packed up, they helped each other carry their items to the luggage shuttle and were sharing contact information to stay in touch after camp. The cultural leaders shared some wrap-up thought for the campers to carry forward with them. Lindsey Howtopat also gavea demonstration on making a cedar bark basket so the campers could visualize how to use the bark they peeled days prior. The campers were aware of the cultural resources that surrounded them at the end of camp and were eager to put that knowledge into practice. The campers returned to Heritage University for a closing talking circle and barbecue with their families. 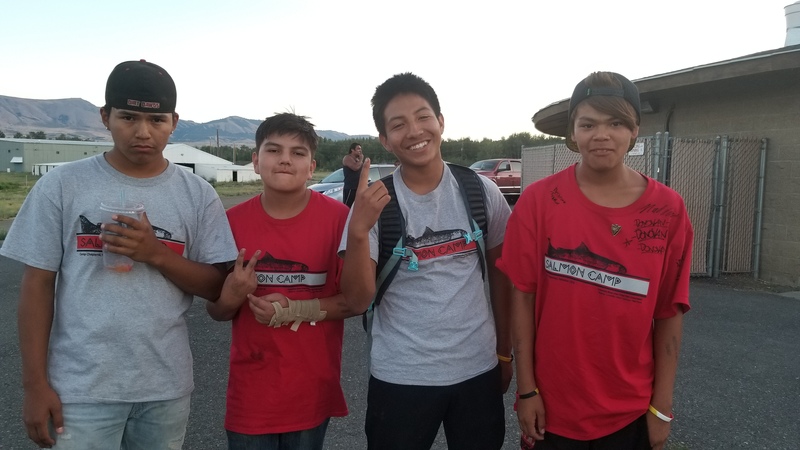 Each of the camp counselors shared words about their cabin campers and gratitude to the families for supporting their youth in attending the 2018 CRITFC Tribal Salmon Camp. 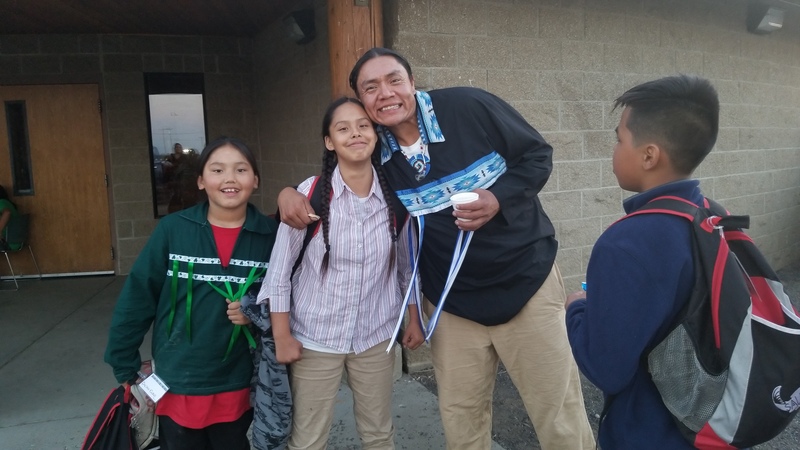 Several weeks after returning home, the Salmon Camp participants presented the posters they created at camp to their families and community during wrap-up sessions held in each tribal community. The experience gave the students an opportunity to practice their public speaking skills as they shared what they had learned about salmon and lamprey and what they enjoyed most about Salmon Camp. The jet boat tour at Hells Canyon was definitely at the top of the list! After their presentations, campers answered questions from their families about their future college and career plans. 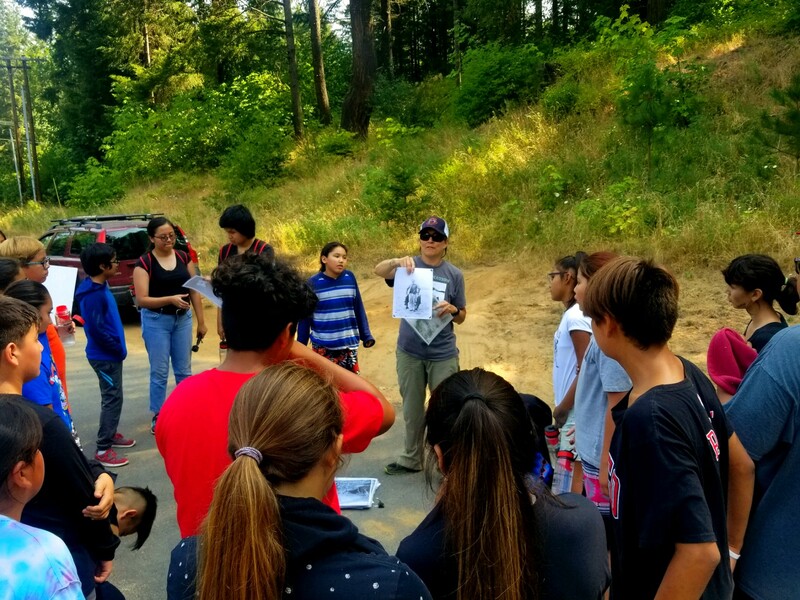 The CRITFC Salmon Camp Coordinator led a discussion on the importance of learning about math and science as students complete their K-12 education. We appreciate the camp’s emphasis on planning for college as it reinforces our discussions at home. Local Planning Committee: Jessica Black, Jeanette Burkhardt, Sandra Celestine, Nick Finley, Elaine Harvey, Anita Mendoza, Donella Miller, Steve Rigdon, Crystal Sampson, Bill Sharp, Jonalee Squeochs, Arlen Washines, Davis Washines. Tribal Partners: Yakama Nation: Tribal Council, Fisheries, Forestry Products, Cultural Resources, Nutrition Program, and Camp Chaparral; Confederated Tribes of the Umatilla Indian Reservation, Confederated Tribes of the Warm Springs Reservation of Oregon, Nez Perce Tribe; Toppenish Creek (WhiteSwan) Longhouse. 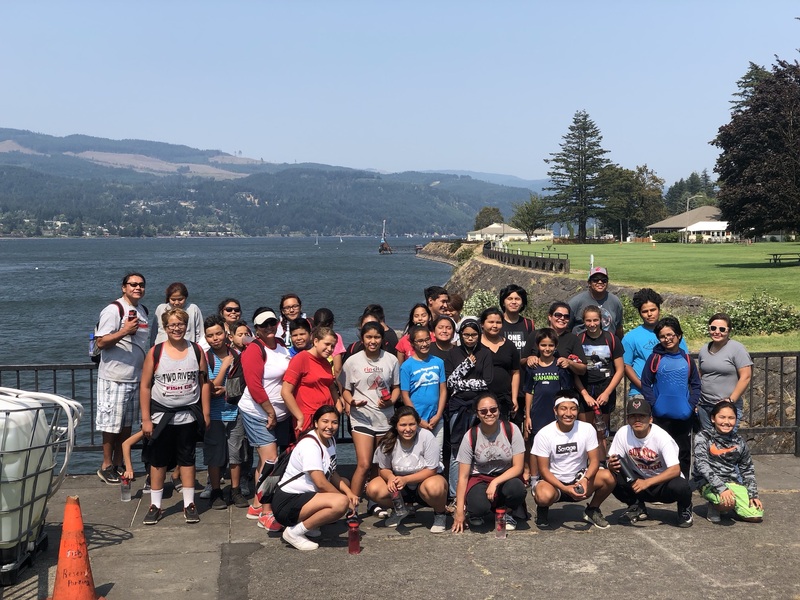 Community Partners: Celilo Indian Village, Brigham Fish Market, Rivers for All, Heritage University, US Fish and Wildlife Service, National Institutes of Health Summer Program for Yakama Students, Bureau of Indian Affairs, Karen Whitford, Lindsey Howtopat, Tamera Gardee, TerrieBrigham, Kat Brigham. 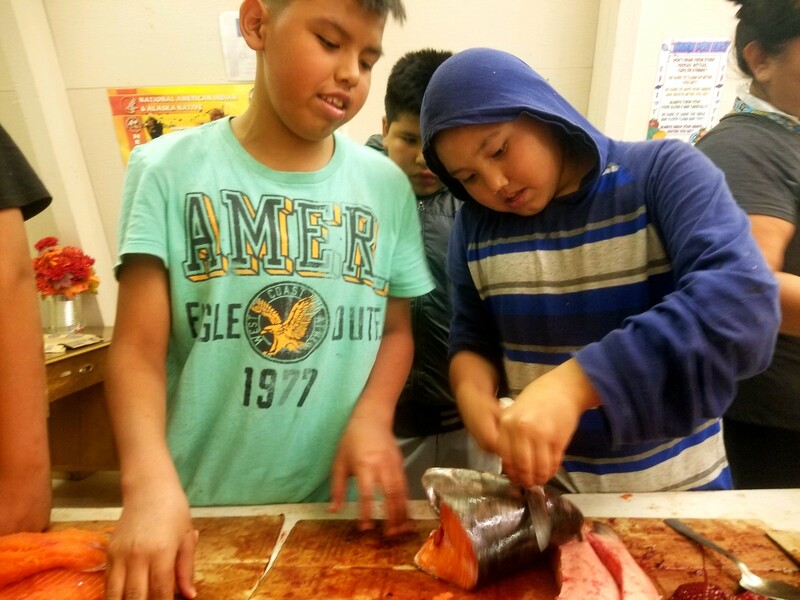 Funding for the2018 Salmon Camp made possible through generous grants from: Bonneville Power Administration, Bureau of Indian Affairs, Gray Family Foundation, The Oregon Community Foundation, and the Yakama Nation. Helping create tomorrow’s leaders in natural resource protection and restoration.